Auto (VC): [Soul Blast 1 Card] When this Unit attacks, you can pay the cost. If you pay it, choose any number of cards from your hand, Bind them face-down, choose 1 of your Rearguards, during that turn, it gains Power+5000. When that turn ends, the cards Bound by this effect are added to your hand. 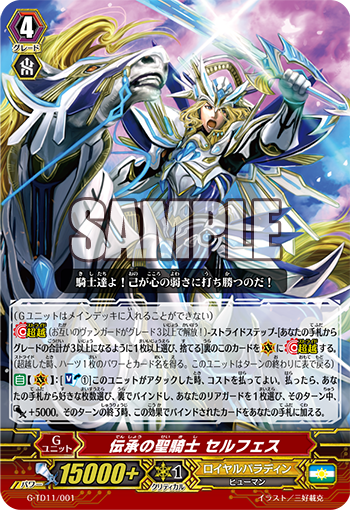 Today’s Card we’re introducing is the 《Royal Paladin》 G Unit “Divine Knight of Legend, Selphes”, included in the Trial Deck “Divine Knight of Heaven’s Decree” (on sale December 9th, 2016). “Divine Knight of Legend, Selphes” is a G Unit that heavily assists the 【Brave】 ability (i.e. when there are 3 or less cards in your hand)! This ability, when this card attacks, lets you pay with 1 Soul Blast, and then Binds any number of cards from your hand face-down, and lets you have 1 of your Rear-guards gain Power+5000! When you attack, you can bind your entire hand face-down, Drive Check to add 3 cards to your hand, and for that turn, you’ll be able to have complete use of 【Brave】. With cards with effects that activate during the Battle Phase, such as “Counteroffensive Knight, Suleiman” or “Shyngal”, so now you can use them without wasting your hand. When the turn ends, you return all of the Bound cards to your hand, so during your opponent’s turn, you’ll have 3 or more cards in your hand to Guard with. It also has the benefit of working well with Units that add cards to the hand when the turn ends. Control the number of cards in your hand by Binding them, allowing you to use 【Brave】 abilities! “TRY3 NEXT”, which goes on sale the same day, has many cards that strengthen 【Brave】! Seize victory with your 《Royal Paladin》 Brave Deck.